On Tuesday, Nov. 27, 2018, the Chisholm Project hold will hold a day-long symposium at Brooklyn College to commemorate the seismic political and cultural impact of Shirley Chisholm’s ascent to Washington, D.C. Chisholm was a member of the Brooklyn College class of 1946. The celebration will include a panel discussion at 11 a.m. followed by our main event at 2:15 p.m. Both programs are free and open to the public. 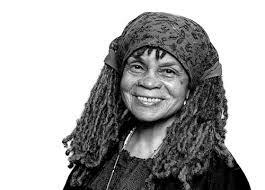 The day of events will be headlined by award-winning poet and author Sonia Sanchez in a keynote dialogue with Chisholm Project Director Zinga A. Fraser, Ph.D. Sanchez is a towering figure in the Civil Rights and Black Arts movement, an international lecturer on racial justice, women’s liberation, and human rights, as well as the author of over 20 books of poetry. In addition to her long list of accolades, she was recently awarded the Wallace Stevens Award for Lifetime Achievement by the Academy of American Poets. 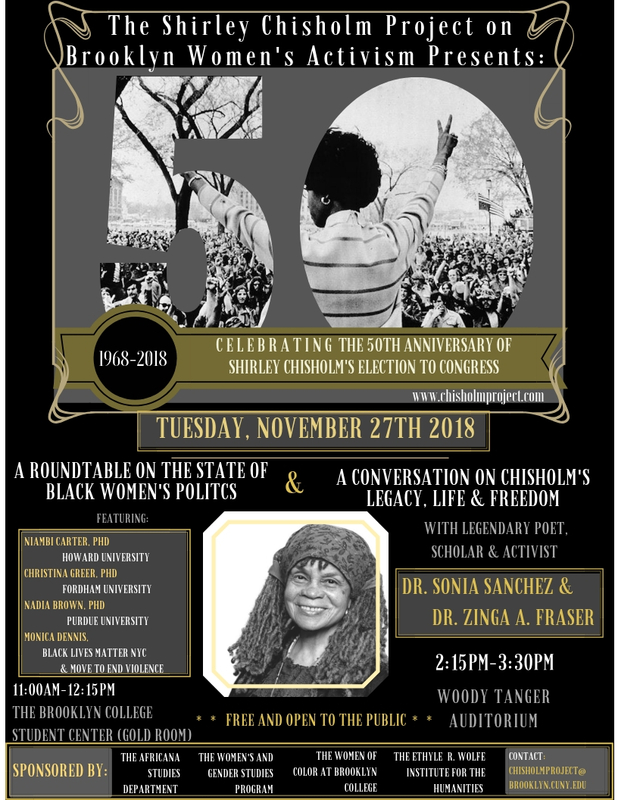 As keynote speaker for the 50th anniversary celebration of Chisholm’s election to Congress, Sanchez will speak at length on Chisholm’s legacy and the black freedom movement, in addition to her activism and art during oppressive political times. The dialogue will take place at 2:15 p.m. in Woody Tanger Auditorium, which is located on the first floor of the Brooklyn College Library. Zinga A. Fraser, who is a Professor of Africana Studies and Women and Gender Studies at CUNY Brooklyn College, will moderate the panel. Together, these strategists and scholars will delve into the promise and perils that face black women in 2018 and beyond as they follow in Chisholm’s footsteps as catalysts for change in the political system and broader society. They will explore role of transformative leaders like Chisholm as well as everyday people in remaking democracy. The panel discussion will take place at 11 a.m. in the Gold Room on the sixth floor of the Brooklyn College Student Center. This November, decades after ‘Fighting’ Shirley Chisholm’s campaign for justice on the national stage began, women like her remain at its vanguard against all odds. Chisholm Day will not only honor the history that was made in years past, but also the strides that women are making today in the #MeToo movement, the Women’s March, the movement for Black Lives, and in the contemporary endeavors of women of color like Stacey Abrams, Ilhan Omar, Ayanna Pressley, Stacy Abrams, Alexandria Ocasio-Cortez, London Breed, and Letitia James—all of whom are marching towards the halls of power and renewing Chisholm’s mandate for social and political transformation.